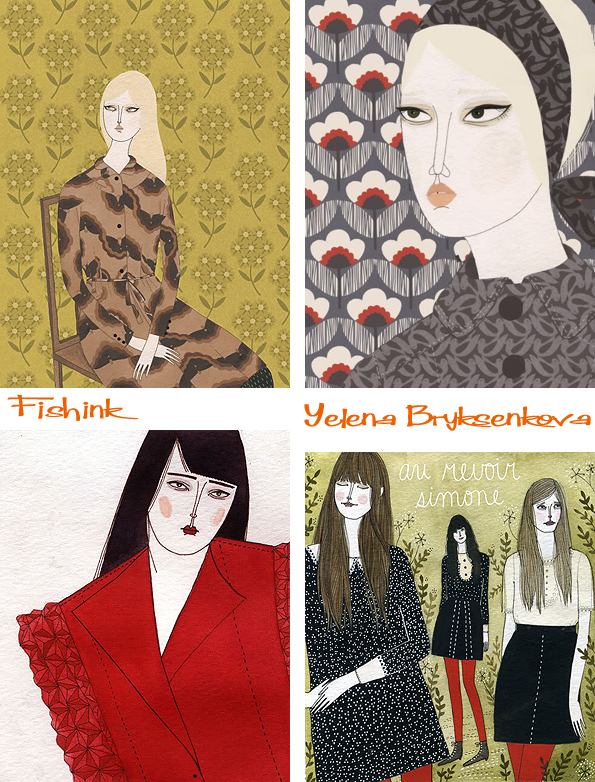 Yelena Bryksenkova From Russia with Love (and Illustration). I sent Yelena some carefully chosen questions and she kindly and enthusiastically replied. How much of your Russian heritage do you feel has formed the person that you are today ? How did your parents come to make the move from Russia to Cleveland ? My mom and I moved to the US in 1996, when I was eight years old, during the post-Soviet wave of emigration. We already had relatives in Cleveland who helped arrange our move. The language – spoken, read, written – is a part of my everyday life, and my heritage will always be a beautiful, mysterious and painful part of me which I’ll never be able to truly verbalize. Russia’s rich visual and literary culture is deeply meaningful to me, but unfortunately it’s one with a very tragic fate, and who I am today and the opportunities I’ve had to grow as a person and artist I owe largely to having grown up elsewhere. You moved from NYC to New Haven ( I also love New England) was this move away from the big city, a decision based around finding a smaller, more personal space to call ‘home’ ? After a brief stint in New York – which I had never really dreamed of – I jumped at the opportunity to live somewhere smaller and more manageable. I do like this little city, which is small enough to get to know well but so charming that it feels new every day (I go on long daily walks and it never gets old; Yale University’s old campus alone is a marvel!) I am inching my way toward Boston, though – that’s a city I have dreamed of living in, ever since I was a tenth-grader on a school trip. You appear to be well read and a painter of characters loving solitude and quieter times. Does this reflect you as an artist or a world that you see around you as perhaps an ideal place to live ? This absolutely reflects me as a person; as much I enjoy time spent with friends and family, I am quite solitary by nature and really value time spent alone, which I suppose is a handy quality to have in my line of work. 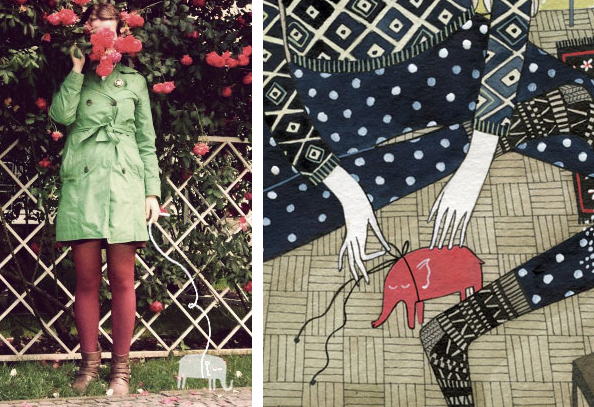 My carefully curated world, in which I am surrounded by things I love, never feels lonely or boring. 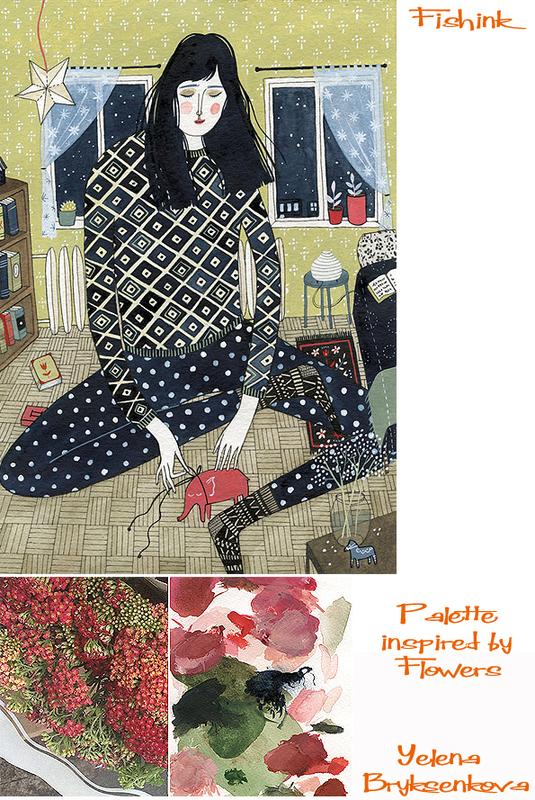 I noticed that you have a ‘healthy obsession’ with detail and textural patterns, whether it be on fabrics, in the home, or flowers in a garden, stars in the night sky etc. Is this desire to capture detail just a part of your developing illustrators style, or part of a painters way of putting more information into a piece of art for the viewer to ‘read’ ? Details – in clothing, in furnishing a home – are deliberate choices that one makes, appreciated by oneself and by those who care to look closely enough, which is why, for me, patterns and colours are very important in communicating the mood and personality of my subject (and inevitably my own). Plus I find the physical process of drawing small details highly meditative, so I can sometimes get carried away! The decisions of which surfaces could use a pattern and also when to stop are completely intuitive. 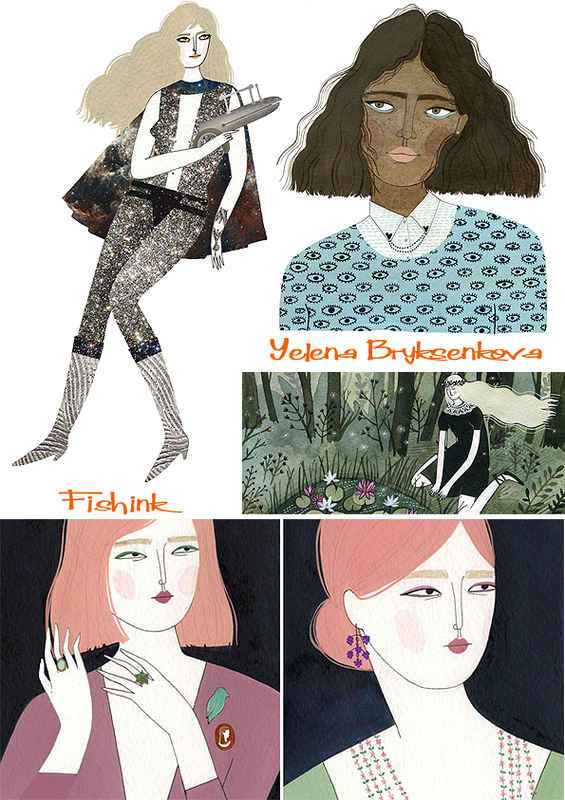 This colour in this illustration (below) was inspired by the flowers and Yelena’s chosen palette from above. 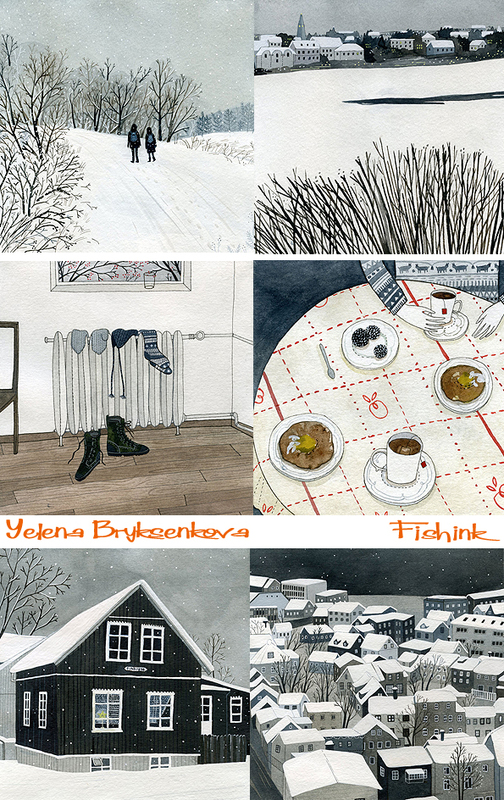 A small series about solitude. 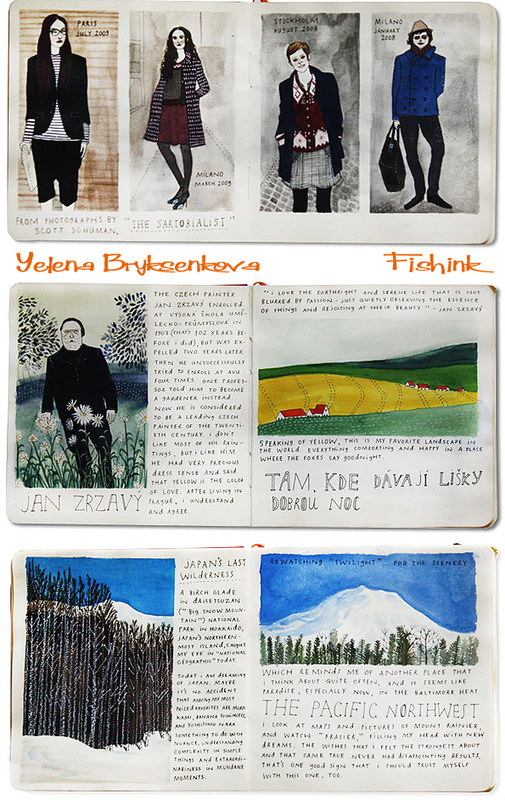 I really like the feel of these images Yelena created from a trip to Reykjavík. You can sense the cold, still climate perfectly. 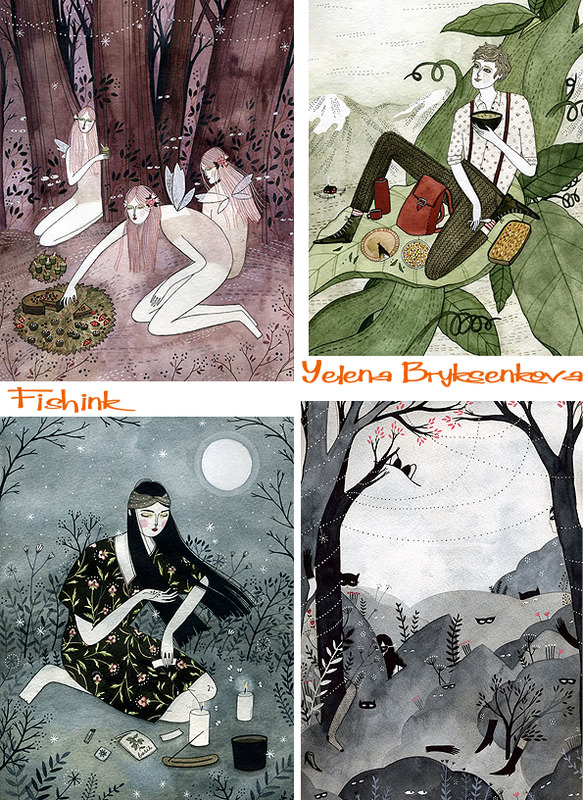 Barbarella, wolf girls and ladies with jewellery are all captured here in Yelena’s personal and editorial work. 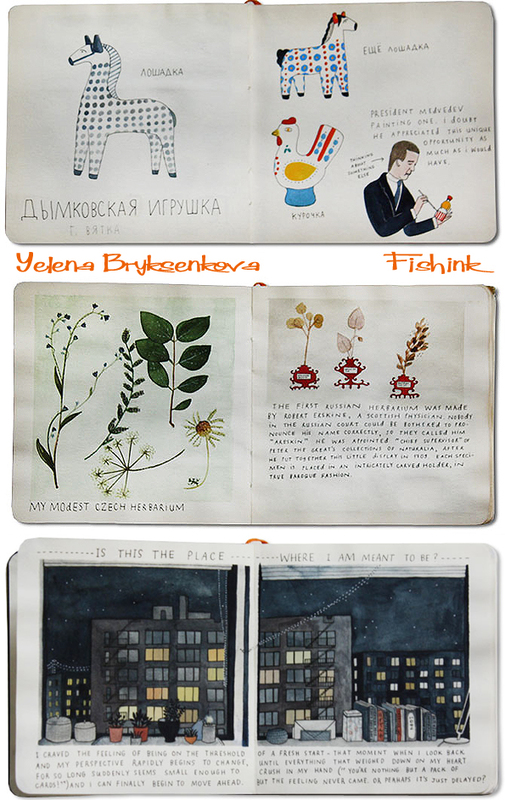 Her sketchbook work is so beautifully laid out, it’s almost like a published book in itself. What have been your favourite commissions to date and who / what would you most like to create artwork for ? 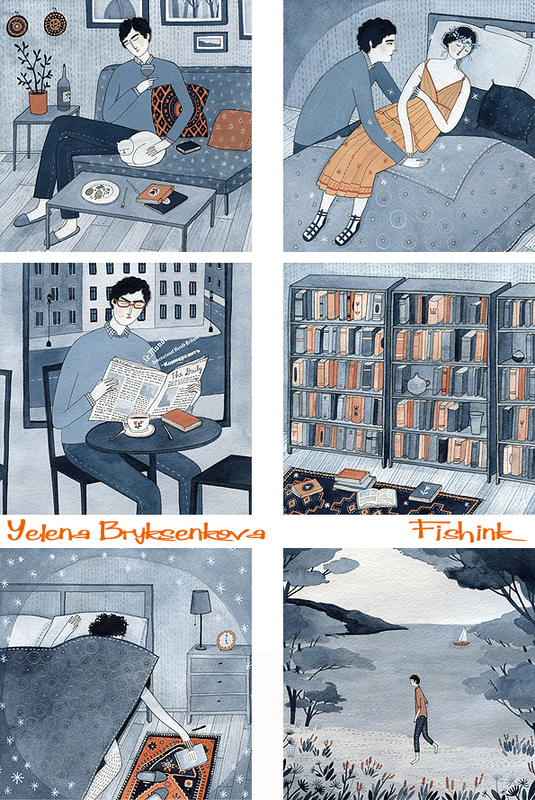 My favorite job to date is one that I just completed – it’s a special illustrated edition of Mrs. Dalloway’s Party for Random House Spain, which will probably be published later this year. I love the 1920s and this was an absolute dream come true; the research alone – clothes, cars, furniture – was intoxicating. 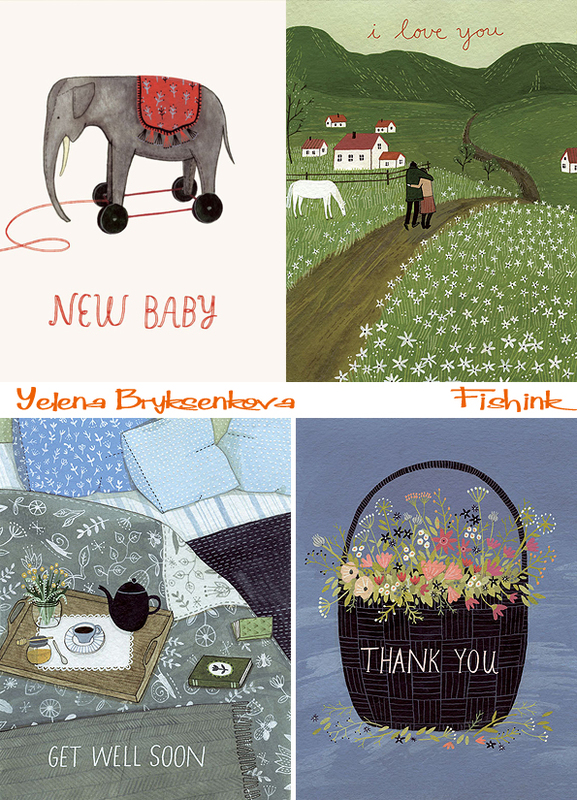 Here’s a couple of other book covers Yelena has illustrated. You mentioned that you love painting girls and their environments and pastimes, where did this interest stem from ? Art imitates life, and my penchant for that subject matter is always reinforced when I look at Impressionist painting. People (mostly women), in quiet repose, surrounded by cherished books and objects. Just a moment in time, nothing more. Although magically, complete strangers in different corners of the world pick up on some secret transmissions that I guess I inadvertently broadcast, and they write me lovely, very moving notes of emotional solidarity, sometimes even in very broken english. Here’s some girls wearing Orla Keily fashions and patterns. I love the notion of your imaginary pet elephant, can you tell us a little more about, where he came from, does he have a name, what does he like to do when you’re busy working ? His name is Vaclav and he just materialized one day, about eight years ago. He’s a dream pet, a comforting thought and a kind of talisman. I imagine he just sleeps all day; very low maintenance and his mere presence at all times is all that is required. Where to next ? any plans for the future and details about new work etc ? I have been very busy working on a couple of special books, and there are two middle grade novels – Aaron Starmer’s The Riverman and Laura Marx Fitzgerald’s Under the Egg – coming out later this month, for which I illustrated the covers. 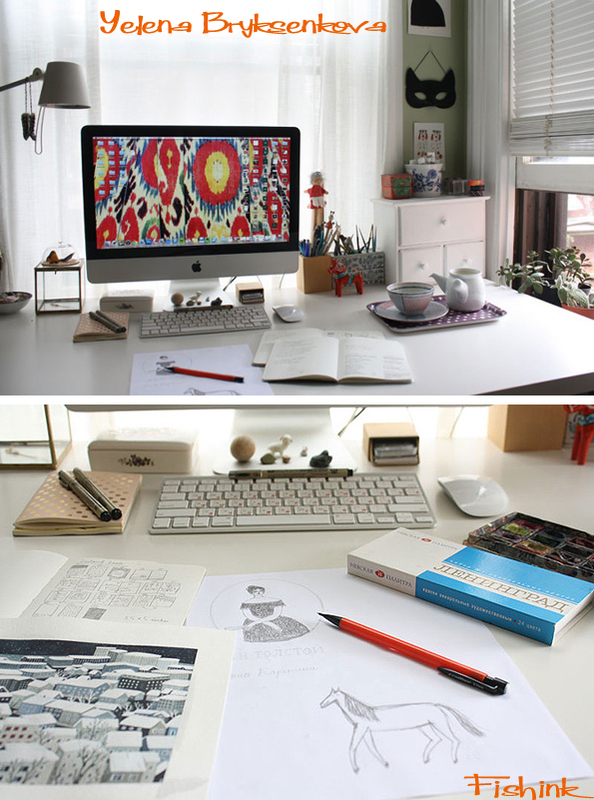 I am so excited to be working with books, finally! 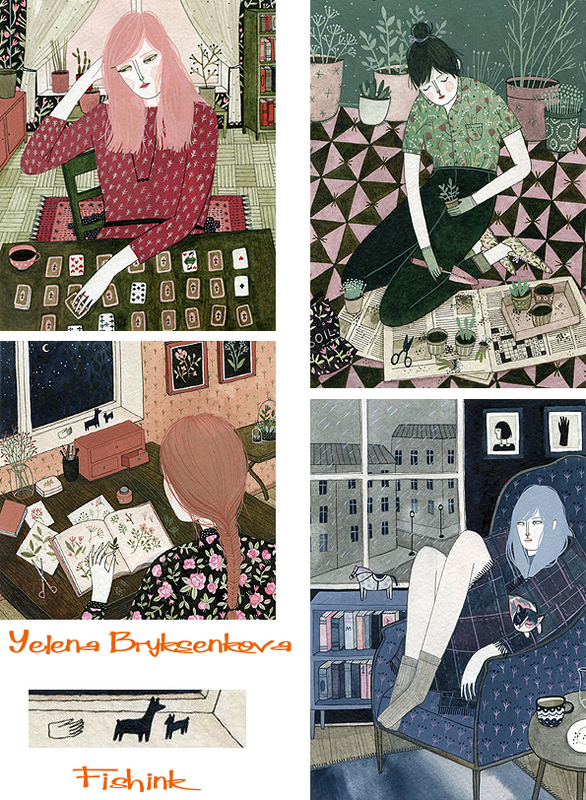 You can see more of Yelena’s work on her Blog and pick up a card or a print or two from her Etsy shop here. ← Fishink Travels. The Tate, Henry Moore and Spring light.